Ryan Villopoto continues to be in championship form, taking his third consecutive victory and sixth of the season with a win at Lucas Oil Stadium for the Indianapolis round of the 2013 AMA Supercross Championship. 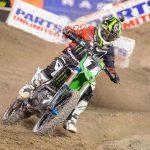 The Monster Energy Kawasaki rider had a calculated, methodical race to take the win and expand his championship lead to nine points ahead of Davi Millsaps. 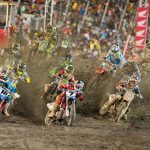 Millsaps took the holeshot in a chaotic start to the main event that saw several riders go down at the opening corner. 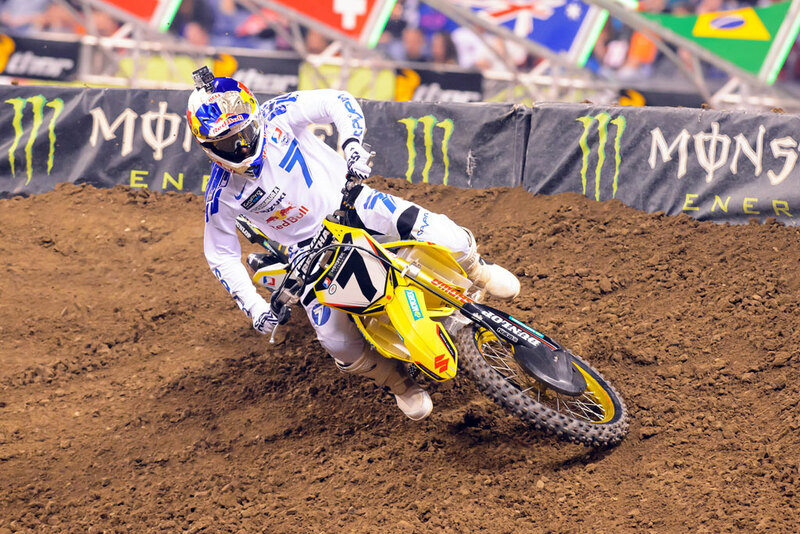 Millsaps’ lead was shortlived, as the Rockstar Suzuki rider went too far wide on a turn, allowing Yoshimura Suzuki‘s James Stewart to take the lead. 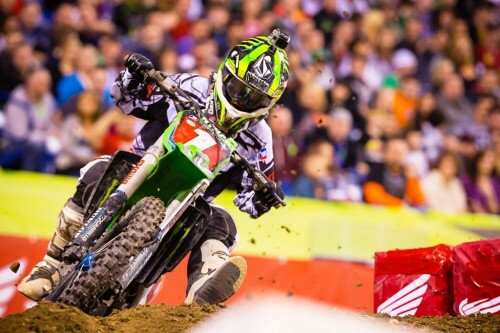 Millsaps managed to stay ahead of Villopoto with Red Bull KTM‘s Ryan Dungey also in the mix. Stewart nursed a comfortable lead until an unfortunate mistake on Lap 7 stalled his engine, dropping him several positions. That handed the lead to Villopoto with Dungey on his tail. 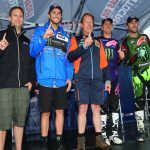 Dungey and Villopoto was the marquee matchup heading into the 2013 season and the two battled for the rest of the 20-lap race. Dungey came close a couple of times but again and again, Villopoto pulled away to take the checkered flag by 6.537 seconds. Meanwhile, another battle was being waged for third place between Millsaps and Stewart who recovered strong following his error. Their fight went right to the final lap when Millsaps made a costly error crashing just after the first turn. The mistake was enough to give Stewart the final podium spot. The 2013 AMA Supercross Championship now moves north to Rogers Centre in Toronto, Canada. Villopoto sits on top of the standings with 227 points ahead of Millsaps’ 218 points. Dungey remains in the title picture sitting in third with 210 points. Team Honda Muscle Milk‘s Trey Canard dropped out of the top five with a hard crash on the third lap. Canard was thrown from his bike after a rough landing and received medical attention before leaving the track on his own feet.